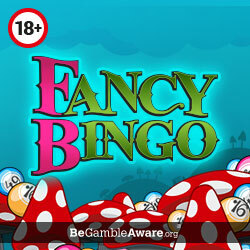 Fancy Bingo Review | Claim 120 FREE Cards On Deposit! Disappear down the rabbit hole to the magical penny wonderland of Fancy Bingo and have hours of fun playing free bingo games, slots and table games. There’s also a tonne of incredible promotions for you to check out, so many in fact, that you may find yourself hanging out with the Fancy Hatter in Wonderland for much longer than you initially expected! If you want to experience this wacky but wonderful bingo site, continue reading our review to find out more information about what you can expect to find here. The Fancy Hatter welcomes all new players to his mad hatter tea party on Fancy Bingo with an extravagant welcome bonus. Sign up today to receive 120 FREE bingo tickets on your first £10 deposit. There are no wagering requirements attached to this offer, so you will be able to keep what you win. Aside from that, there are plenty of free games you can play, with no deposit required, so you can try out the site first before whipping out your card details. 120 free bingo tickets when you add £10. Free bingo cards on your second and third deposits. Daily guaranteed jackpots & sliding jackpots. Free bingo and 1p penny bingo games. Prize giveaways & VIP programme. Get £10 in bonus cash for every friend you refer. Fancybingo.com isn’t currently offering any promotional codes, but there’s no need to panic as there are still lots of jackpots and promotions you just don’t need a promo code to take advantage of them. There’s no mobile app available for Fancy Bingo, but the site is mobile friendly so players can still play whenever it is convenient for them from their tablet or smartphone. Simply, enter the web address into your browser on your mobile or tablet then sign in – it’s as simple as that! You can use the same login details across all your devices which make it even more convenient for you. Powered by Dragonfish software, Fancy Bingo is very similar to their sister sites such as Crocodile Bingo and City Bingo. The Fancy Hatter invites you all to enjoy his large library of games which includes bingo, slots and table games. You’ll probably want to check out the bingo games first and who could blame you with the fantastic selection on offer. There’s a number of differently themed rooms hosting a variety of 90 ball, 75 ball and 5 line games which offer you the chance to scoop up some unbelievable prizes. As well as all the regular games you’ll find guaranteed jackpot games and progressive jackpot games which really spice things up a bit. One of the bingo highlights of this site is the weekly Rabbit Hole Riches promotion, offering you the chance to scoop up £5,000 for free! Talking of freebies there are also three free bingo rooms. The Bingo Academy is unlocked for 24 hours on registration, with no deposit required. The other two rooms are for funded players only, however, they feature much larger prizes of up to £50 every hour. Fancy Bingo is also a magical haven for slots players with a huge number of top quality slots to choose from such as Enchanted Prince, Lost Island, Wolf Run, Neon Staxx and much more. If it’s a bargain you’re after then there’s plenty of 1p and 5p slots for you to try out. Casino players will also have a great time at Fancy Bingo with the likes of blackjack and roulette to try their luck on. 120 free bingo tickets on your first £10 deposit. Reload bonuses on all deposits. Payment options available on this site are Paysafecard, Neteller, Mastercard, Maestro and Visa. When you request a withdrawal it takes 48 hours to process. Phone number: 0808 238 7563. We absolutely love Fancy Bingo and we think you’ll be blown away by it too. There are so many fantastic games on offer that players will want to stay at Wonderland and with all the free bingo and cheap bingo tickets you’ll certainly be able to afford to. So don’t delay, sign up today and grab your 120 free bingo cards!